It’s official, the 2018 WNBA season is just 100 days away. With the release of the 2018 schedule on Thursday, we now know that Season 22 will tip off Friday, May 18, in Phoenix. That’s just one of many game days we’ve circled on our calendars, and you should as well. There will be 204 games played over 94 days before the regular season ends on Aug. 19 and another exhilarating playoffs begin. Here are a handful of can’t-miss matchups. Season 22 opens with the Phoenix Mercury hosting the Dallas Wings in a matchup of playoff teams from a year ago. The Mercury feature last year’s scoring champ (Brittney Griner, 21.9 ppg), the WNBA’s all-time leading scorer (Diana Taurasi, 7867 points and counting) and a returning DeWanna Bonner (3-time Sixth Woman of the Year), who missed last season due to pregnancy. On the other side is All-Star Skylar Diggins leading a young (last year’s roster included seven players with two years or less in the WNBA) and talented roster that just added a formidable presence in Liz Cambage. The No. 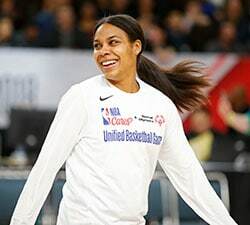 2 pick in the 2011 WNBA Draft out of Australia last played in the WNBA in 2013 when she averaged 16.3 points, 8.3 rebounds and 2.4 blocks for the Tulsa Shock, before the franchise relocated to Dallas. The clash between the 6-foot-8 Cambage and the 6-foot-9 Griner should be exciting to watch this season … and it begins on opening night. While the Las Vegas Aces won the 2018 WNBA Draft Lottery to secure the top pick in this April’s draft, the next three picks currently belong to the Fever (No. 2) and the Sky (Nos. 3 and 4), who face off in the season opener for both teams. Indiana found itself in the lottery for the first time since 2005 as its WNBA record 12-year streak of postseason appearances finally came to a close in 2017. Adding top-tier talent with the No. 2 pick could help the Fever turn things around quickly, as injuries to key players also played a role in their 9-25 season a year ago. For Chicago, they hold the Nos. 3 and 4 picks in the draft as they look to build around the backcourt of Courtney Vandersloot (who set the WNBA record for assist average last season, 8.1 apg) and Allie Quigley (3-point champ at last season’s All-Star Game). This is the first of three days this season – along with June 22 and the regular season finale on Aug. 19 – that will feature all 12 teams in action on the same day. This six-pack of games is full of great storylines, including the debut of the Las Vegas Aces (on the road in Connecticut) and the debut of their No. 1 overall pick in the Draft. It also includes a matchup between the WNBA’s all-time scoring leader (Diana Taurasi) and all-time assist leader (Sue Bird) as Bird’s Storm hosts Taurasi’s Mercury in Seattle. 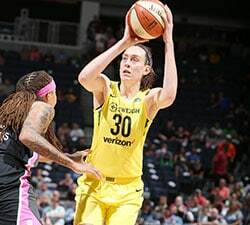 This game not only features two of the all-time greats, but two of the top young talents in the league in Griner and Breanna Stewart – who finished 1-2 in scoring last year. Griner had a breakout offensive season in her fifth year in the WNBA, while Stewart followed up her stellar rookie campaign with no signs of a sophomore slump. Can she make another leap in year 3? Think of other versatile forwards that entered the WNBA with the type of pedigree that Stewart possesses. Elena Delle Donne won her MVP honors in her third year, while Maya Moore did it in her fourth. Stewart shows all the signs of being on the same path. But the marquee matchup of the day will take place in Minnesota at 5:00 p.m. ET on ESPN2 as the defending champion Lynx host the Los Angeles Sparks in the first of four Finals rematches this season. After the second-straight epic five-game series, the Lynx outlasted the Sparks to claim their fourth WNBA title. Last season, we had to wait nearly two months into the season before the first Finals rematch between L.A. and Minnesota. This time around, both teams make their season debut against one another, back in Minnesota, where the Lynx will hang banner No. 4 as their championship rivals look on. Three of the four meetings between the Lynx and Sparks will be on ESPN2 this season. If these matchups are like what we’ve seen the past two years, you won’t want to miss any of them. The Connecticut Sun stumbled out of the gate in 2017, opening the season 1-5, before exploding thanks to young core of talent coming together and finding its way faster than many expected. And they did this without All-Star forward Chiney Ogwumike, who missed the entire season with an Achilles injury. It was the second time in three years that Ogwumike was forced to sit out the WNBA season due to injury as she missed 2015 due to knee surgery. In her absence, the Sun still thrived thanks to the explosion of WNBA Most Improved Player Jonquel Jones and the steady play of fellow All-Stars Alyssa Thomas and Jasmine Thomas. Adding Ogwumike back into the mix may take some time, but the potential for a dominant frontline is there. Speaking of a dominant frontcourt featuring an Ogwumike, the Los Angeles Sparks feature Chiney’s older sister Nneka (2016 MVP) and Candace Parker (2008 and 2013 MVP). The athleticism and varied skill sets of the four frontcourt players in this game should be fantastic to watch in this early-season matchup. After sitting out the 2017 season, Angel McCoughtry is back in the ATL as the Dream host the Wings. The Dream have been busy in the opening days of free agency, adding point guard Renee Montgomery from Minnesota and forward Jessica Breland from Chicago to help bolster their lineup under new head coach Nicki Collen. The return of McCoughtry will be a welcome sight for the Dream, who averaged the third-fewest points in the WNBA a year ago. Angel owns the fourth-highest scoring average in league history (19.5 points per game) and is one of the most dynamic two-way players in the league. Getting her back on the court is not only huge for the Dream, but the for the WNBA as well. 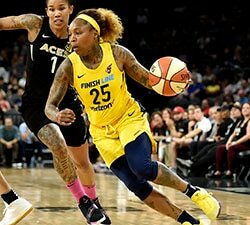 The Aces make their home debut in Las Vegas against the Seattle Storm to close out the second week of the season in the league’s newest venue. Not only does this team have a new city, a new name, new colors and new logo, they also have a new head coach and president of basketball operations in Bill Laimbeer to help shape a new identity for a team that has not won more than eight games in any of the past three seasons (23-79 cumulative record). Laimbeer has already added Carolyn Swords and Tamera Young in free agency and acquired Kelsey Bone in a trade with Phoenix to add veteran leadership to a young roster. And he also holds the proverbial “ace” up his sleeve in the No. 1 overall pick in the Draft. This is the second straight year that the team will draft first as they added guard Kelsey Plum with the top pick in 2017. The last team to draft No. 1 in consecutive years is their opponent for their home debut – the Seattle Storm, who added Jewell Loyd and Stewart in 2015 and 2016. While players have moved in opening days of free agency, so far there has not been a seismic talent shift like we saw last offseason with former MVP Elena Delle Donne changing teams. Whenever a scenario like that arises, you have to circle the return game as one to watch during the upcoming season. While we still await a blockbuster player trade, we should consider the move made by Laimbeer to exit from New York and take the helm in Las Vegas. Laimbeer is one of three coaches to win Coach of the Year with two different teams – Dan Hughes and Mike Thibault are the others. After winning Coach of the Year with Detroit (2003) and New York (2015), can Laimbeer repeat that task in Las Vegas? He welcomes his former team – the Liberty – to the desert in late June. After spending years coaching Katie Smith in Detroit and helping her transition to coaching in the WNBA in New York, now Laimbeer will face off against Smith on the opposite sideline. In five All-Star Games this decade (2011, 2013, 2014, 2015 and 2017), the Minnesota Lynx garnered more selections (18) than any other team by a wide margin (Phoenix and Chicago are tied for second with 12 apiece). Now, rather than having nearly their entire starting lineup board a flight to the All-Star destination, they’ll be able to stay at home. 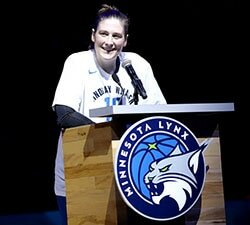 For the first time ever, the city of Minneapolis and the Lynx will host the WNBA All-Star Game, as the top players in the world come together to compete and celebrate the game. Maya Moore has taken home MVP honors in each of the last two All-Star Games. Can she make it three in a row in front of her hometown fans at the Target Center?